The estate sale fairies were good to me lately. Are you ready for some delicious vintage eye candy? These are some of the newest treasures for sale in my Etsy store, Vintage by Suzanne. A few of these deserve some extra love because they are just so damn fine. You know I wouldn’t be selling this lovely 1970’s maxi dress if it were two inches shorter. Some lucky tall gal is going to love this. Aren’t the sleeves amazing? What was your favourite piece? I think you know already which one mine was. It’s true…I haven’t stopped growing. I’m just growing in the wrong direction. You do find the most amazing items, Suzanne!! I could shorten that dress for you since it’s your favorite?? As for my fave, it’s a hard pick! 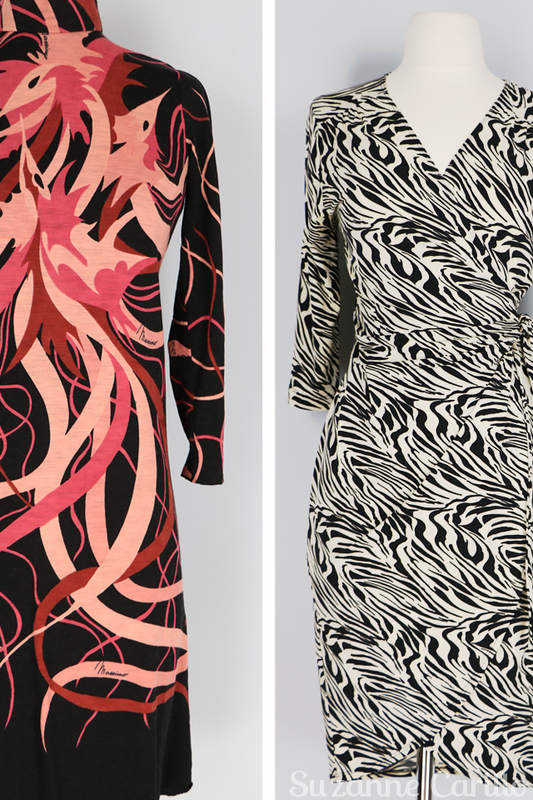 The watercolor dress, the zebra dress….such loveliness!!! What an eye you have and I love them all! 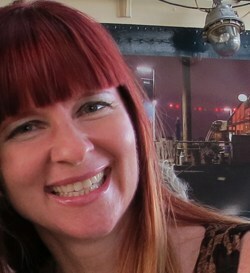 I hope you have a wonderful 1st weekend of the new year! Love them all! 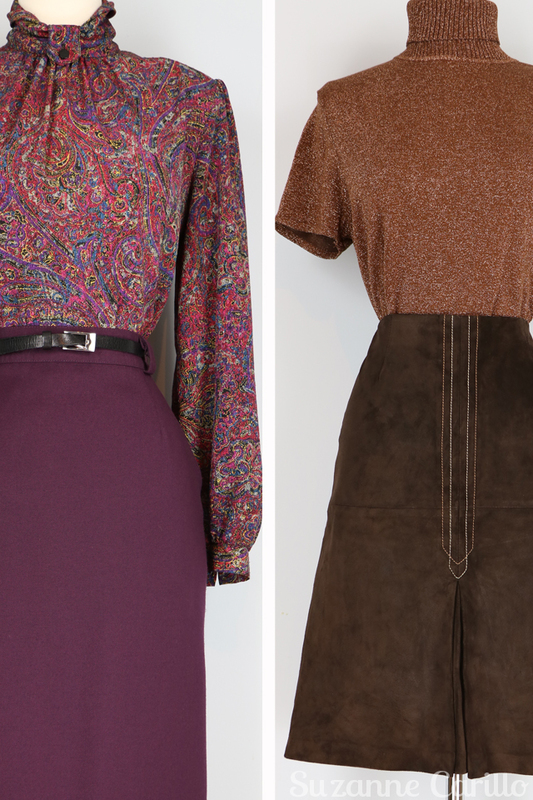 But oh, that graphic vintage wool dress!!! That favorite is definitely worth the time, energy, money to have shortened. You look so lovely in it! I’m trying to be very dedicated to selling the items I curate and believe me, it is a super difficult task when I find so many great items. The reality is that my closet cannot handle all the goodness I find. Oh some lovely finds here, Suzanne. The brown maxi, hat and boots are fabulous on you! Can’t you just take the hem up? 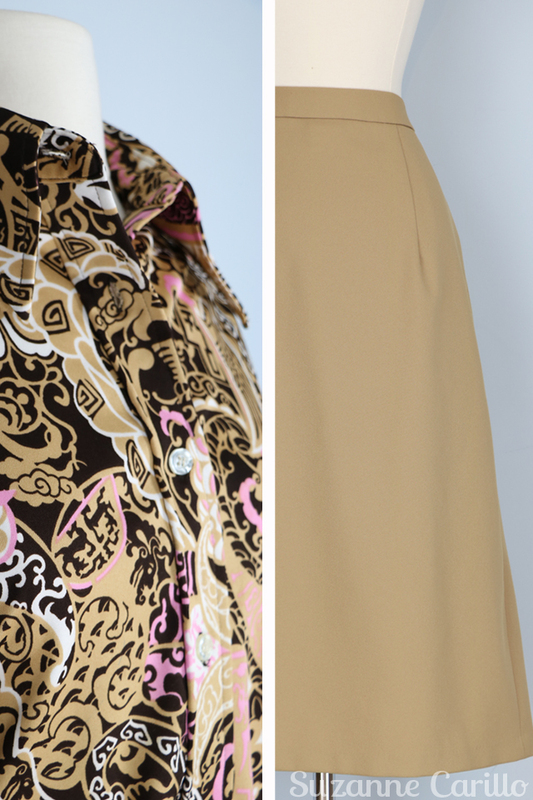 I loved the vintage paisley blouse…too small alas! Everything is so great! Sadly, I’m a bit too chunky for those great wrap dresses that I will now be constantly thinking about. There’s some cracking finds there! I love the handmade maxi with the orange top especially. Of course love the dress and especially the boots on you! Those boots are pretty sweet. I just wish the heels were a bit lower. Oh don’t give up the dress you like! Just shorten it, that’s an easy fix. 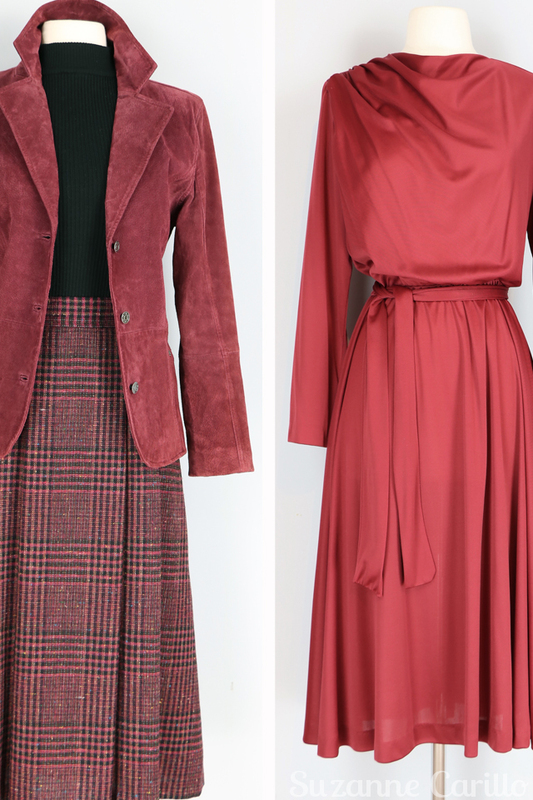 I am trying to stick to the idea of having a vintage store to sell items and not to add to my ever growing collection. The length on this dress was the perfect excuse not to keep it. WOW! I used to think you were just lucky in finding exceptional pieces but now I know it isn’t luck, it’s skill. “Luck” is what happens when a talented person dedicates serious effort to a task. Respect! You are right Ally. I have seriously dedicated myself to finding some excellent pieces even if that means heading out in rain, sleet or snow like I did yesterday. It is a time consuming job but one I enjoy. My goodness – don’t grow up!!! Heh. I like the chocolate dress, but holy cow, that orange and blue print maxi is pretty fantastic on you. You are so good at styling all your pieces. Yes, as Shybiker says, your “luck” is mostly innate talent, SKILL, and time. Time is the operative word as you well know Melanie. Yesterday I forced myself to get out again and visit some new stores and was very pleasantly rewarded for my efforts. Now I’ve got loads of work! Oh you look fantastic in that orange with blue print skirt maxi! That and the blue/green watercolor with the suede boots are my favorite. If I were your size I’d be snatching those up. 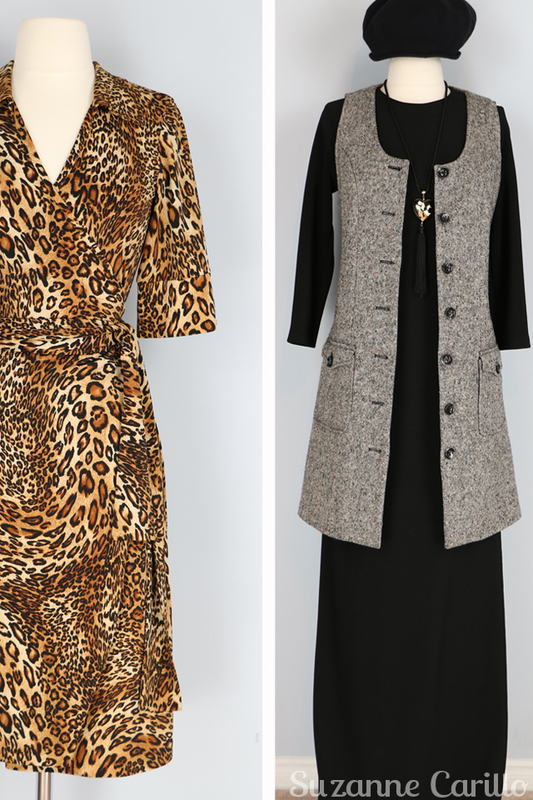 I immediatly fell for the leopard wrap dress! In my size. And a very good Prize! But the shipping is the same prize….. But I don t understand the Etsy thing. Did you buy and wore these items yourself and now selling it of don t I understand it properly. Is this your own webshop? 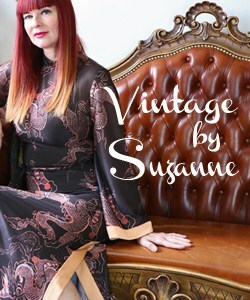 I have two Etsy stores, one where I sell my cards I design and necklaces I make, Simply Creative by Suzanne Carillo and then I opened this one, Vintage By Suzanne about 5 months ago where I sell vintage clothing that I curate. While I do model some of the items I don’t necessarily wear them. I take photos for the Etsy store so people can see what the piece looks like on someone. Of course sometimes I do keep the pieces. Sadly overseas shipping is hugely expensive. Dear Suzanne, your favorite dress happens to be my favorite piece too, in the middle of these amazing eye candies that you prepared for us! 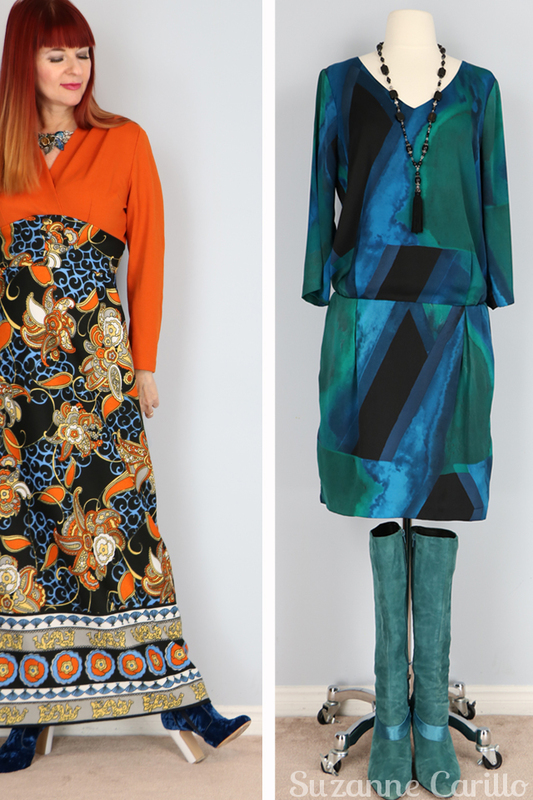 I loved the boots that you are wearing with the flutter sleeve dress and I also loved the 70s handmade maxi dress and the suede blazer, together with the skirt you paired with it. All so fantastic things, I am in love with everything and I just wish I was a bit thinner, so to buy many of the pieces! Hope you have a fantastic week! Bisous! 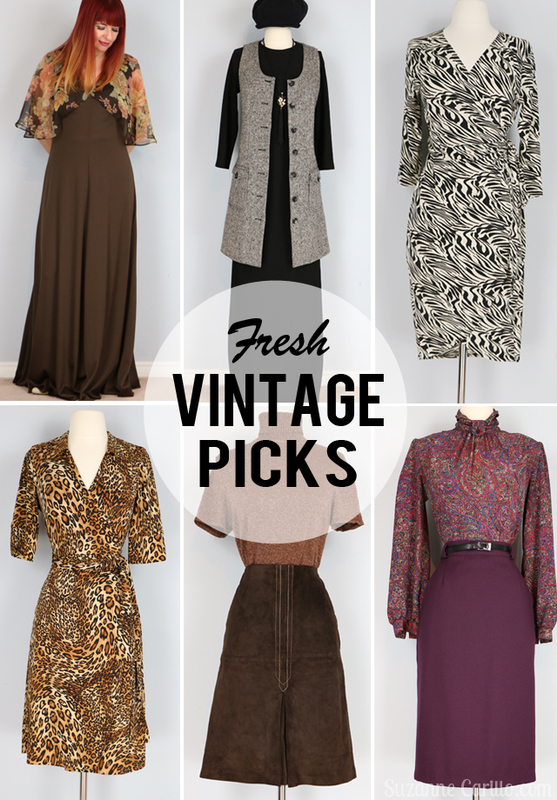 Fabulous finds, I love all those colors and prints and suede!. And you have the best boots! gorgeous! I love the handmade 1970 maxi dress with the orange top best. Only, I have a size Large… And I saw that you are selling the brown suede skirt.. what a shame. You obviously didn’t agree with my arguments to keep it. 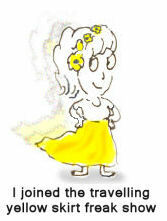 And yes the dress you wear is ever so nice. It cannot be difficult to adjust the hem, so I figure you don’t think you will wear it a lot (I saw your reply on Tiina’s comment). You know I can’t pick a favorite. I love everything you showcase and how you put it together with other things. Do let me know if you think anything would fit me–you nailed my sizes last time I bought things from you, so I totally trust your judgment in that department. Meanwhile, keep your peepers on my blog because over the next few weeks/months I’m working through all the other fun things I’ve bought from your Etsy store! ?